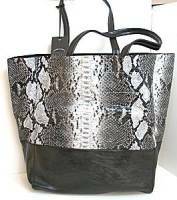 Liz Soto's design career includes fashion, jewelry, and most recently handbags. Her upbringing in Central California and studies in college there as well as Mexico City provided her the tools to start designing. 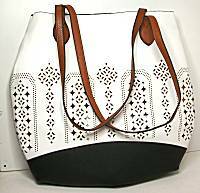 Still in California, now in coastal Santa Monica, Liz designs bags with luxurious fabrics, fresh color to work in the current season, and simple embellishments to keep them affordable. 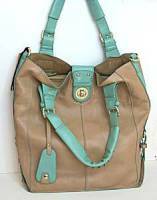 Lovely faux leather bag, with distressed texture like a shaved suede, is colored a cool aqua green. Soft construction, measures 11 inches across bottom, 7-1/2 inches across top frame, 7 inches tall, 4 inches deep but flexible to conform to personal items. The center front and outer edges are trimmed with pleated ruffles, not too frilly, but enough to feminize the shape. Top closes with brass hardware. Interior lined in brown floral print fabric with small zip pocket and cell phone pocket. 28 inch brass chain shoulder strap is accented by aqua crystals and champagne glass pearls. Detachable purse charm has oversized charms and baubles in clear crystals and more of the white glass pearls. 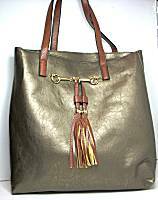 Lovely faux leather bag, with distressed texture like a shaved suede, is colored an off-black like charcoal with tan flecks. Soft construction, measures 11 inches across bottom, 7-1/2 inches across top frame, 7 inches tall, 4 inches deep but flexible to conform to personal items. The center front and outer edges are trimmed with pleated ruffles, not too frilly, but enough to feminize the shape. Top closes with brass hardware. Interior lined in brown floral print fabric with small zip pocket and cell phone pocket. 28 inch brass chain shoulder strap is accented by smoke crystlas and champagne glass pearls. Detachable purse charm has oversized charms and baugles in clear crystals and more of the white glass pearls. 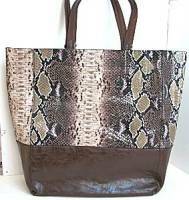 Read about what others think of Liz Soto bags! Instead of reviews for a specific product, this is a place to share about the designer line in general.